There's nothing quite like Chicago on St. Patrick's Day. For the last few years, Brandy has managed to avoid the hordes of drunken Chi-rish revelers who crowd up the bars and brunch joints every mid March with their tiny green hats, shiney green beads, and puddles of frighteningly green bodily fluids. "If Chicago could hold its liquor half as well as it thought it could," Brandy often moans, "I wouldn't mind these sort of arbitrary drinking holidays. But if my proud Celtic ancestors were to see how these Yankees behave on such a sacred holiday, they'd probably charge the masses with flaming arrows and claymores in full tartan regalia, just to teach them a lesson!" But this year, Brandy could not resist the siren's song of celebration when her dear friend Bailey Blue came calling. "I've never been to see the river get dyed for St. Patty's Day! We should go!" "It's not St. Patty's Day, first off. It's St. Paddy's Day," Brandy sighed, "And you'll not be getting me out amongst those beer soaked crazies first thing on a Saturday morning." "Oh please? We can go have an authentic Irish brunch afterwards!" Bailey pleaded. As Brandy's moral code strictly forbids turning down any invitation to brunch, this seemed to seal the deal, and it was decided that after the river dying, the pair of them would adjourn to The Gage for some nosh and slosh. The Gage was in full swing when they entered, with plenty of fun seekers already crowded into the front bar area. Luckily, Brandy had made reservations ahead of time, so they were taken to a table in the back room straight away. "Good thinking," said Bailey as they sat. "I wasn't about to fight all those inebriated idiots for a seat!" Brandy sniffed. From what Brandy could see of the restaurant, it looked to have a surprisingly casual feel for somewhere so prominently located in the heart of The Loop, but it also had a more sophisticated feeling than a typical Irish pub. A group of fiddlers were playing music at the front of the restaurant to the delight of the crowd, and a wandering bagpiper really helped to bring in the festive atmosphere of the day. Bailey and Brandy jumped in head first with the day's special drink, a sort of punch made from mead, blueberry, white whiskey, and citrus juices called the Kiss Me, I'm Irish. The drink had a lovely freshness to it, but disguised its potency behind its subtle sweetness and infinite sip-ability. "I don't know that it's necessarily Irish, per say," Brandy commented, "Other than that it is red headed." The women then split an order of the House Poutine, which perhaps wasn't authentic to the holiday, but definitely felt in the spirit. The gravy had a wonderful flavor to it that didn't overpower the rest of the dish. Brandy was very impressed by the perfectly melty cheese curds, while Bailey wondered that the fries had remained crispy, even under the tasty gravy. They then moved on to bowls of some Irish Potato-Ale Soup. The presentation for the soup could not have been more beautiful, with the liquid portion being poured tableside over a bowl of brown bread croutons, chunks of bacon, and pickled ramps. Though both Brandy and Bailey found the soup a little on the thin side, it did have a nice subtle flavor of beer, and the mix of textures in the garnishes truly made it something special. Bailey picked the Corned Beef Sandwich for her entree, as she felt tradition had to be heeded on such an occasion. The sandwich came on toasted marble rye and decked out with pickled cabbage slaw and Guinness soaked Swiss cheese to give it a Rueben like flavor profile. Though Bailey said she couldn't really find any Guinness flavor to the cheese, she did love the tangy slaw and the incredibly tender corned beef, which melted like butter on the tongue. The dish did come with a side of more house made fries, but Bailey found herself unable to partake in any more potatoes for the day. Brandy decided on the Guinness Braised Brisket Pot-Pie. The crust of the pie tasted more like a buttery biscuit to Brandy, which she didn't mind in the least, finding it stood up well to the tender brisket, stout scented gravy, and sauted veggies within. Unlike the cheese on Bailey's sandwich, Brandy could definitely taste the Guinness throughout this dish, which lent an almost coffee like earthiness. Brandy also loved the simple side of braided and peppered cabbage along with some roasted carrots. "I'd proudly wear the tartan of any Irishman who presented me with this dish!" Brandy proclaimed. As the Michigan Avenue Parade was in full swing outside, Brandy and Bailey decided to hunker in doors a little while longer and ordered up some dessert and one last round of drinks, namely a flight of Irish whiskies, which they happily sipped and discussed. The special dessert of the day was something simply called Whiskey and Stout, which turned out to be a sort of parfait ("It's called a trifle, for goodness sake!" Brandy proclaimed) made out of chocolate and Guinness cake, whiskey spiked cream, and Irish cream ice cream on the top. "I feel woozy after the first bite!" Bailey laughed, though the two glasses of punch and whiskey flight she'd had previous to dessert probably contributed as well. The cake was beautifully moist and rich, balanced perfectly by the airy cream layers. Overall, the dessert was certainly decedent, but such a perfect end to a brilliant meal. After rising (just barely) from their table and heading for the door, Bailey and Brandy found themselves so in the spirit of the holiday that the green clad rabble at the front bar no longer seemed like advisories to be avoided, but jovial chums to be joined. It may have been the amazingly efficient and friendly service (an accomplishment worth noting, as St. Patrick's Day is one of the busiest days of the year at The Gage), it may have been the clean hearty flavors of the food, or it may have been the massive amount of booze they'd ingested, but the pair simply couldn't bare to leave the delightful atmosphere of The Gage, so with a mighty yell of "Slainte!" from Brandy, they settled down in front of the the fiddlers and danced the afternoon away. The inside of Carnivale is like no other restaurant in Chicago. After being lead through a curtained lounge area with a wall sized display of all the 200+ tequilas the restaurant has in stock, diners are welcomed into a very large rectangular dining room, which according to Brandy, "Would bring a smile to the face of the most unhappy man in the world." The establishment's moto of "Live the Colorful Life" is so perfectly expressed here: everywhere are bright, vibrant exclamations of color, like the towering palm trees, the swooping fabrics, the changing lights behind the enormous wine displays, the stained glass sunlight inlaid in the ceiling, and even the waitstaff, clad in beads, wigs, and other pigmented frivolities. The vastness of the place was helped along by the towering height of the ceiling, which looked to be at least half a mile over their heads. "I usually prefer somewhere a little more dark and dank for my meals," said the Baron, "But I suppose I can make an exception just this once." Immediately after taking their seats, a glorious booming voice was heard over the dining room. The music, it seemed, was coming from a man clad in chef's whites who stood at the back of the room on a balcony of sorts, singing an aria a capella to the brunchers, who all erupted in applause at the end of his song. Soon after that, a string quartet appeared out of no where to perform some light classical music mixed with pop songs. "This place is like Disneyland," Brandy said in wonder, "I can't wait to see what pops out of the next door!" Brandy and The Baron began with a couple of drinks; for Brandy a Screwdriver spiked with pomegranate juice, and for The Baron, a concoction known only as The Paloma. Brandy missed the pomegranate kick from her screwdriver, which was otherwise pretty typical, but very fresh tasting. The Baron's Paloma packed quite a powerful tequila punch with a salty and sweet note, much like a Margarita. They started off their meal with some Bacon Wrapped Dates. These little beauties came beautifully presented on a red endive leaf with some bleu cheese dressing and a sour apple slaw. Brandy loved the smokey sweetness of the dates mixed with the vinegary slaw and the creamy dressing, and the textures of the crisp apples, soft dates, and crunchy almond in the center were an absolute delight to the senses. For their entrees, the lovely server explained that at Carnivale, the diners were encouraged to order dishes for the table and dine family style so that everyone could get a taste of everything. Going with that spirit, The Baron decided on the Fried Egg Sandwich as well as the Key Lime French Toast. "Sweet and savory are your M.O., I believe, yes?" he asked Brandy with the raise of his eyebrow. Brandy tried the sandwich first, which came with a side of house-made "tater tots." The so called taters were actually quite unique; Brandy thought them more like croquettes with their soft interior and crunchy coating, though with such attention to detail in everything else, she would have liked to see a more creative dipping sauce than ketchup. The sandwich was done very well, with the richness of the egg and melty cheese cut by the addition of some tomato and lettuce. The crusty toasted bread held together fairly well, but the sandwich did leave the eater's fingers and little less than pristine, though as Brandy said, "It's not a good egg sandwich if your aren't licking your fingers after finishing it." The Key Lime French Toast was one of the most original dishes Brandy had ever seen at a brunch table. The bread seemed to be a bolero style roll, as it had a tougher, chewier exterior than more French toasts she's come across, but the inside was soft, supple, and yielded a filling of key lime cream. The toast had also been covered in a pineapple syrup and sprinkled with fresh berries, which helped to break up the sweetness with a dash of tart. "This dish tastes of sunshine," The Baron remarked in amazement, "And I'm not normally a fan of sunshine." Lastly for dessert, The Baron threw caution to the wind and ordered up some Chocolate Covered Bacon. "My dear, we've already had two courses with bacon today," Brandy reminded him. "And we shall have three!" he roared grandly, "After all, this place has re-ignited my thirst for hedonism. No pig shall be sparred from the furry of my gullet!" The bacon, which was house made, came thick cut and enrobed in a generous coating of dark chocolate. It was meaty, salty, smokey, and rich, or in other words, everything one could expect of such a dish. Between the extraordinary atmosphere, the creative and decadent menu, the stellar service, and the surprisingly reasonable prices ("$5 cocktails?!" Brandy exclaimed when she saw the check, "Bring me three more!") 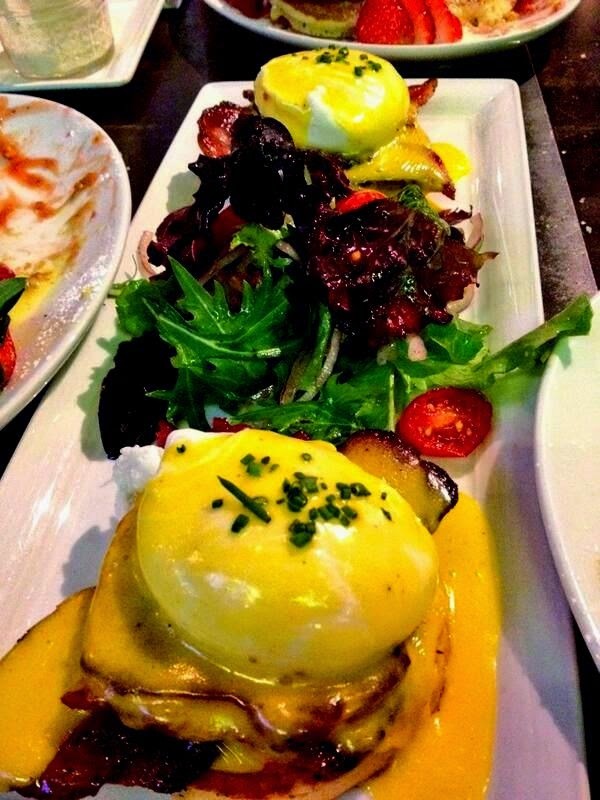 Brandy and The Baron found their morning at Carnivale to be simply exemplary. "Perhaps I have been neglecting the more cheerful things in life lately, " The Baron lamented, "Sometimes a spot of sunshine and a coudry of color can do a distressed mind some good." "Yep. And a good cocktail doesn't hurt either!" was Brandy's reply. Food News: Free Uber Rides to Brunch! Like timid woodland animals, freshly woken from their long winter's nap, the residents of Chicago are slowly beginning to poke their heads out of their fortresses in hopes that Spring may finally have arrived. The ice mountains on the side of the road are beginning to melt into grimy puddles, dogs all over the city are permitted to go for their walks with out wearing a sweater, and best of all, we can all start going out to eat again instead of relying on intrepid delivery boys to bring us sustenance. 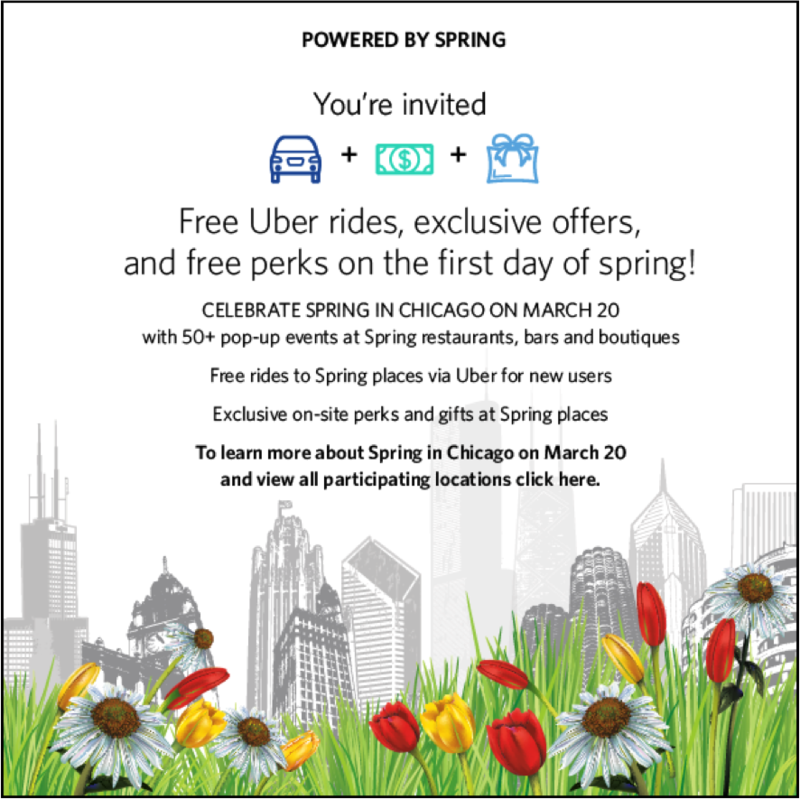 To aid us in our quest for Spring, Spring Rewards is throwing a fabulous celebration This Thursday, March 20th, which will include all sorts of pop up events, surprises, and even free Uber rides to 50 participating Chicago area shops and restaurants, including: Von Z, Mulberry + Me, Red Door, Takito Kitchen, Little Threads, Sedgwick Stop, Quay, Universal Sole, Sola, Joe's Bar, Roka Akor, Slurping Turtle, Clarke's, Kamehachi, Fixture, Jak's Tap, Village Tap, Craft, Geja's Cafe, Denim Lounge, Riverview Tavern, Glam to Go, Hubba Hubba, Cinnamon, Pizza Rustica, Uptown Lounge, Pops for Champagne, Ahjoomah's Apron, Chuck's Manufacturing, Paramount Room Volo, Lather, Pizzeria Serio, Taverna 750, Bow & Stern, Burton Place, Emporium Arcade Bar, Sataza, Green Door, Real Comfort Kitchen, Beer Bistro (West Loop & Lincoln Park), Chi-town Eatery, Crush Boutique, Schuba's, Lincoln Hall and more! Brandy, for one, is definitely planning on doing a little shopping and a little brunching tomorrow, and with free rides from Uber to and from participating locations, she won't have to worry about muddying her loafers. "I love a good bit of snow in December and January, but this year has just been gratuitous!" Brandy has been saying for weeks now, "A nice morning of week day brunching is just the thing I need to shake off the ice from my shoulders and get back out there amongst the living." Check out the link below to join Brandy in taking advantage of all the brilliant events from Spring Rewards! For those of you who follow Bunny and Brandy on Twitter, you may have seen our very special Live Tweet preview of the new brunch menu at Public House this past January, where Brandy was treated to a bevy of brand new and beautiful dishes that the River North gastropub would be dishing up every Saturday and Sunday morning. Well, now that the menu has been officially launched at a blogger's only tasting event this past Saturday (organized by the wonderful team at Chicago Food Bloggers), Brandy has strongly encouraged us to give our readers a rundown of some of the delectable treats in store! Public House has done an excellent job of providing brunchers with creative and classic dishes, both sweet, savory, and in between. They've also made a concerted effort to keep everything in house, from the freshly made turkey or pork sausage to the thick cut bacon, and beyond. Luckily, some of the favorites from the old menu have made it onto the new, like the Donut Fried French Toast, which though its had a little makeover, has lost none of its decadent allure. The brunch cocktails have also been kept intact, including the Signature Bloody Mary and Loaded Skewer, the Blood Orange Mimosa, and the Breakfast Trio (a set of three delightfully breakfast themed shots with an orange juice chaser). New to the savory portion of the menu are a couple of Benedicts, of which the BLT (with housemade bacon being utilized instead of ham slices and also in a vinaigrette, topping the arugula salad that comes with the dish) and the Crab Cake variety were particular standouts. There's also a rather brilliant Breakfast Sandwich, made with the diner's choice of any of the house made meats and dressed with arugula, tomato, red onion, and scrambled eggs, all served on a soft sourdough bun. Straddling the line between the two extremes are the Chicken and Waffles, accompanied by hot sauce and maple syrup. The chicken is fried on the bone to retain its juiciness, and the coating is thick, crunchy, and eminently satisfying. The waffles have been caramelized slightly to add just the slightest hint of sweetness to an otherwise savory dish. The sweet side of the menu is no less impressive. There's the Sticky Buns, made in the traditional Southern style with toasted pecans and a vanilla scented frosting. Then there's the Yoghurt Pint with fresh berries, house made granola, and creamy vanilla bean yogurt, all served in a tall pint glass. 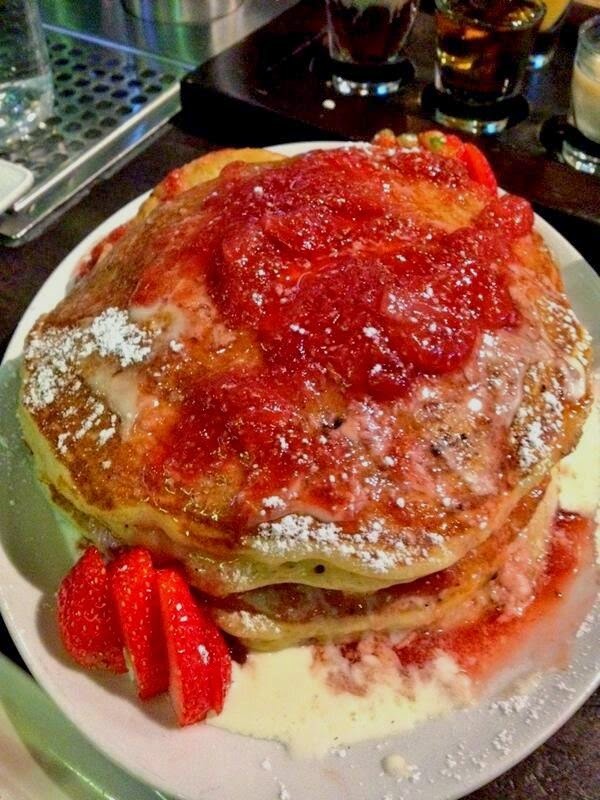 The positively dessert like Strawberry Shortcake Pancakes were one of Brandy's definite new favorites, with their soft fluffy texture, craveable jam, and mascarpone cream filling. Check out Brandy's original post on Public House from last fall to compare her old favorites with the new! Food News: A Magically Delicious St. Patrick's Day! Goodness knows there is more than enough to do in Chicago for St. Patrick's Day for the Irish and non-Irish alike. There's the famous river dying ceremony (where the Chicago River goes from being only slightly green to be being a much brighter green), there's the myriad of restaurants and pubs serving up all day specials laced with plenty of Guinness, Jameson, and food coloring, and of course there's the St. Patrick's Day Parade down Michigan Avenue. Well this year, the parade will be hosting a very special guest! Brandy has it on good authority that Lucky the Leprechaun, beloved mascot of everyone's favorite marshmallow based cereal, Lucky Charms, will be on hand at the Chicago St. Patrick's Day Parade as a part of his 50th birthday celebrations, a 50 day journey in which Lucky has been spreading his magic far and wide to fans of all ages (you can follow along by visiting Lucky's Tumblr Page or by using the hashtag #LuckyWasHere). There's also a limited edition version of Lucky Charms in stores now, so do be on the look out! As part of the celebrations, Lucky himself (or at least that's what Brandy has told us) has provided us with two delightfully festive recipes for your enjoyment, either of which would be sure to delight friends and family at your St. Patrick's Day festivities. "After all," Brandy says, "One can only take so much corned beef and cabbage without wanting a little splash of color!" dissolve if needed. Top with tonic water and lemon juice. Make 6 cocktails, 1 of each color, to make a rainbow! Line a 10-inch round cake pan with sheets of plastic wrap. Lightly coat the plastic wrap with cooking spray. Melt the butter in a large heavy-bottomed stock pot over low heat. Add the marshmallows. Stir occasionally until the marshmallows and melted and well incorporated with the butter. Stir in the cereal with a large rubber spatula. Pour the cereal mixture into the prepared pan. Press the mixture into the pan with buttered fingers. Cover and place in the refrigerator until solid, about 2 hours. For the rainbow cake layers, heat oven to 350°F. Grease and flour two 8-inch round cake pans. In a large mixing bowl beat together the cake mix, water, oil and eggs with an electric hand mixer on low speed. Scrape down the bowl and beat again on medium speed until well combined and no streaks of powdered cake mix remain. Divide batter evenly between six bowls, about 1 1/3 cups each. Using the food color, tint one bowl red, one orange, one yellow, one green, one blue and one violet. Pour two of the colors in each of the prepared pans. Cover and refrigerate remaining bowls of batter until needed. Bake the cakes 18-20 minutes, or until a toothpick tester comes out clean. Cool in the pans for 5 minutes and then transfer to wire racks to cool completely. Wash cake pans and bake two more colors, repeating the above steps. Repeat process until all cakes are baked and cooled. Remove cereal treat from refrigerator and unwrap. Place on a serving platter upside-down so the flattest part of the cake is turned upright. Spread a small amount of vanilla frosting in the center of the cereal treat layer and stack on the violet cake layer. Lightly frost the top of the violet layer and place the blue layer on top of the violet layer. Continue in this manner with the green, yellow orange layers. Place the red layer on top but do not frost. Place remaining frosting in a large mixing bowl. Add green food color and mix with an electric mixer on medium until a vibrant green shade is achieved. Frost the entire cake with the green frosting. Using the chocolate cupcake frosting fitted with the plain round tip (provided) draw lines of frosting around the base of the cake creating a “hatband”. Fill in the lines with more chocolate frosting and smooth with an off-set spatula. Press four pretzels into the chocolate frosting to create a square buckle. Break the last pretzel in half and place one half, horizontally, to the right center of the buckle to create the buckle latch. Store the cake loosely covered in plastic wrap. 4 cups of mini marshmallows may be used instead of the 10 oz. package of regular-size marshmallows. All colors needed for the rainbow cake can be made from the three primary colors red, blue and yellow. An orange tint can be made by mixing red and yellow food color. Violet can be achieved by mixing red and blue. Green can be achieved by mixing yellow and blue. Three 8-inch cake pans may be used to bake three cakes at once, decreasing the time to make this cake by 20 minutes. Recipe created by Betty Crocker birthday cake blogger Heather Baird of www.SprinkleBakes.com. As some of you may know, March is the official start to the I'll Try Again Next Year Season, when everyone who resolved to eat healthier in the New Year officially start to give in to their baser urges for bacon, chocolate, and liquor. In honor of this so called March Madness (yes, we know this is not what March Madness really means, but Brandy doesn't) Brandy has devised a special brunch recipe this week using two of the cardinal sins of food: Beer and Deep Fried. Heat oil in a large saucepan or deep fryer to approximately 365 degrees. Meanwhile, in a medium sauce pan, add 1 can of beer and the sausages and bring to a soft boil over medium low heat. Let the sausages cook in the beer until heated through, about 15 minutes. Using a pointed wooden skewer, carefully run it through the sausage lengthways. Combine all of the dry ingredients in a large mixing bowl (for a thicker more pancake like batter, add in all of the flour, or for a thinner, crispier batter, only add 1 cup). Slowly add one can of beer to the mix and whisk through until smooth. Dip the sausages one at a time into the batter, then place immediately into the hot oil. Fry the sausages for 1-2 minutes, or until the batter on the outside is golden brown, then set on paper towels to dry. Serve with honey mustard or maple syrup for dipping. Brandy was so taken with this simple beer batter recipe that she actually used it again to create a side dish. Taking white cheddar cheese curds, which she stacked on skewers, Brandy covered them in the batter and set them to fry until golden brown. For these she used a chunky marinara sauce for dipping. *The writers of this blog were provided with samples of Tecate Light for the purposes of review.